There are other Bloomfield Townships in Michigan. Location of Bloomfield Township within Oakland County, Michigan. This Metro Detroit township was organized in 1827, the first township to be established in Oakland County. It almost completely surrounds the city of Bloomfield Hills. Along with Bloomfield Village, Bloomfield Township is mistakenly referred to as Bloomfield Hills. In 2010, Bloomfield Township ranked tenth in the top ten most expensive suburbs in America, making it the most expensive area to live in the state of Michigan. According to the United States Census Bureau, the township has a total area of 26.0 square miles (67.4 km²), of which, 25.0 square miles (64.6 km²) of it is land and 1.1 square miles (2.8 km²) of it (4.19%) is water. As of the census of 2000, there were 43,023 people, 16,804 households, and 12,703 families residing in the township. The population density was 1,724.5 per square mile (665.8/km²). There were 17,455 housing units at an average density of 699.7 per square mile (270.1/km²). The racial makeup of the township was 87.70% White, 4.30% Black or African American, 0.08% Native American, 6.47% Asian, 0.05% Pacific Islander, 0.29% from other races, and 1.11% from two or more races. Hispanic or Latino of any race were 1.38% of the population. There were 16,804 households out of which 31.1% had children under the age of 18 living with them, 68.1% were married couples living together, 5.7% had a female householder with no husband present, and 24.4% were non-families. 21.6% of all households were made up of individuals and 9.3% had someone living alone who was 65 years of age or older. The average household size was 2.53 and the average family size was 2.97. In the township the population was spread out with 23.8% under the age of 18, 4.2% from 18 to 24, 21.7% from 25 to 44, 32.5% from 45 to 64, and 17.8% who were 65 years of age or older. The median age was 45 years. For every 100 females there were 94.1 males. For every 100 females age 18 and over, there were 91.2 males. The median income for a household in the township was $103,897, and the median income for a family was $123,381 (These figures had risen to $119,233 and $144,033 as of a 2007 estimate). Males had a median income of $98,985 versus $50,540 for females. The per capita income for the township was $62,716. About 1.2% of families and 2.5% of the population were below the poverty line, including 3.0% of those under age 18 and 3.1% of those age 65 or over. The Lower School and Junior School campuses of the Detroit Country Day School are located in the township. ^ "Contact Us." Detroit Country Day School. Retrieved on September 13, 2009. 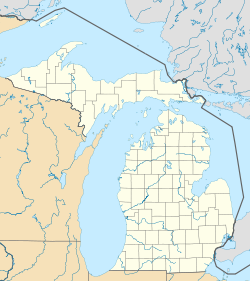 ^ "Bloomfield township, Oakland county, Michigan." U.S. Census Bureau. Retrieved on September 13, 2009. ^ "Article: State says accelerants found at Franklin home." Deseret News. July 13, 2003. Retrieved on September 13, 2009. This page uses content from the English language Wikipedia. The original content was at Bloomfield Township, Oakland County, Michigan. The list of authors can be seen in the page history. As with this Familypedia wiki, the content of Wikipedia is available under the Creative Commons License.